Posted by santos. This entry was posted on 20050108 at 4:39 PM You can skip to the end and leave a response. Lucky u santos. Was it big and sweet? It looks dribble. Wow! Another mango post! I was really going to post one and there's another, Green mangoes at JMom's blog. Are we all thinking of the same thing? How old is your mango tree? Perhaps it will bear more fruits around summertime. it was definitely big--almost the size of a small child's head. and fibrous, like a small child's head. but tasty, sweet and yes, dribble! i just saw jmom's post. 'tis the season :-) the tree is about 8 years old, but it flowers during typhoon season and of course, they get blown away before they can bud. the last supertyphoon pushed the tree sideways, which seems to help because now the flowers closer to the ground are protected--maybe next year we'll see more! Hi Santos! What a coincidence that we both posted about mangoes. I bet yours tasted a lot better though, fresh off the tree. 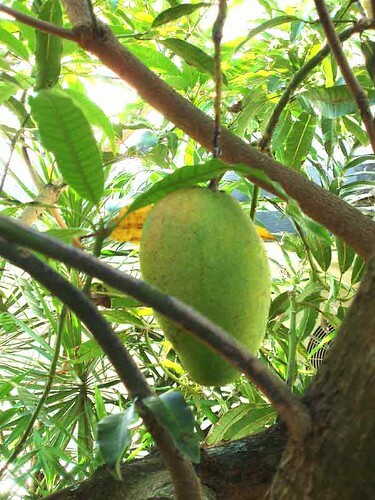 My grandmother's house has a mango tree right in front, and oh, it was sooo sweeeet! this was probably a lot like the one you had. the seed (the tree came from seed) was from a hawaiian mango, which i think is haden. most of the mango trees here are closer to the philippines' carabao, but are smaller and stay green. still, i'm happy that we've got them!